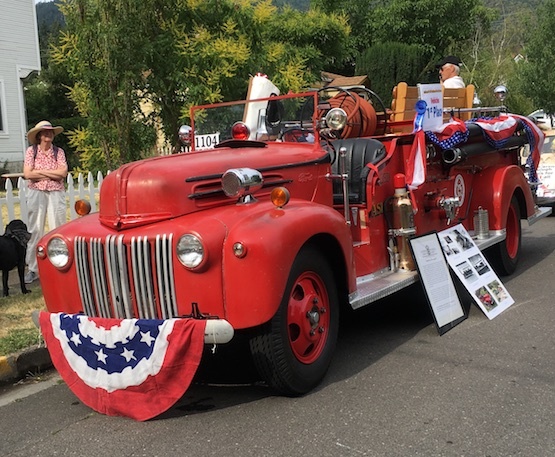 This blog will document the progress of the rehabilitation and preservation of a 1946 Ford Fire Engine once owned by the Ashland Oregon Fire Department. The Fire Engine was donated to the Southern Oregon Historical Society in May 2017. Our grand plan for participation in this year's parade was to meet at Hanley farm around 9:00 Saturday morning. Simple. But when we tried it we all found our way blocked by police and hundreds of Pear Blossom Run participants. My attempts to get through or even to find a decision maker to get us through would be boring to relate. Every policeman I talked to said I wouldn't be able to get through until 11:00, the same time the parade would begin. I drove to our spot in the lineup, where I found the Elegant Bustles and Bows people waiting patiently. I told them I would try to make a miracle happen, but not to count on having a fire engine to ride. Ten o'clock found me resigned and back at home, where I got a phone call from Cyndi Noyes--the hero of this story--who while I was wrangling with the state trooper at Bybee Corner was doing the same at Hanley and Rossanley. What Cyndi did differently was not to give up. If you ask her I'm sure she'd be happy to relate the tale of her ever-so-polite (yeah, right) conversation with the trooper on her end, who refused to let drivers through even though the runners were gone. So Cyndi was still at the intersection when he decided to let people through at 10:00. She called me, and I raced to the farm and picked up the fire engine. It must have been the last entrant to arrive at the parade lineup, where I found Bustles and Bows still waiting. Doug McGeary was there too, and I shanghaied John Miehle from the Holly Theatre float to help Doug carry our banner. John is a founder of the Medford Food Coop and a Holly volunteer. The combination of the fire engine and costumed riders and walkers was a success. People were happy to see us. The engine started fine, and the vehicle ran like a champ all day. After the parade Doug and I parked the fire engine by the Lithia tower and let kids climb on it and take it apart. Everything that could be taken apart by hand was disassembled and put together again, some of them repeatedly. We had as many as a dozen kids on it at a time. At 4:00 the crowds began to thin, so Doug and I stowed our artifacts and gear and got ready to go. Doug was ready to direct me as I reversed. Started it up, put it in reverse, let out the clutch, and--nothing. First gear, nothing. Second, third, fourth--nothing. How could I have burned out the clutch without being aware? I had run it in the parade in the "granny gear"--compound low--so it wasn't like I was feathering the clutch all the way. It seemed like forever, but we finally noticed that the power takeoff lever was in neutral. Now we had yanked on that lever for a year while we were getting the fire engine back on the road, and it wouldn't budge--but it couldn't stand up to a couple hundred kids. And thus endeth my story. I stowed the fire engine back in the barn, drove home, had a hard cider and took a nap. The end. The SOHS Amphibious Fire Engine will be at the Wood House Harvest Festival on October 6th and 7th, from 9am to 4pm. Come on out! First Prize in the Ashland Parade! SOHS's fire engine won First Price for Vehicles in the Ashland Parade! The fire engine's first appearance in Ashland in forty years marks the end of yet another phase in its life and the beginning of a new one. Thanks to Alice Mullaly and Doug McGeary for carrying SOHS's banner to assure that people understand SOHS is responsible for saving this piece of history and making it operational again. The parade was a success. Thousands of people were exposed to the fact that SOHS still exists, and that SOHS is aware that Ashland exists. Now we need to reiterate that message in every other community in Jackson County, and continue to do so. Children (especially four-to-twelve-year-olds) reacted with great enthusiasm to the engine when it was parked on the Plaza after the parade. At times we must have had a dozen at a time climbing on it, trying on the helmets and constantly working the siren, horn and bells. (And occasionally the starter.) Maybe it was all the noisemaking opportunities it offers; maybe it was because there wasn't much else for kids to do after the parade. The challenge before SOHS now, with the withdrawal of the rehabilitation team, is whether a new group will materialize to make the decisions and do the scheduling, maintenance and driving necessary to KEEP the fire engine--and SOHS--before the public. Contact me. We had a donation jar inconspicuously displayed, and we received $47.51 in gas money from appreciative parents. The children diassembled several things, but did no permanent damage. I was a bit concerned about all the electricity consumed by the constant honking and siren-ing, since the generator was still not working and I'd driven to Ashland on the battery. Fortunately, I'd thought to charge our spare battery, which I had to install by the side of the road on the way home. Ready for the July 4th Ashland Parade! After thousands of volunteer hours--and thousands of dollars of community donations--Ashland's Amphibious Fire Engine is whole again. Before recounting the gory details of the last few days, a few acknowledgments are in order. Actually, many, many acknowledgments are in order. Many more people have contributed to this effort, in equally indispensable ways both great and small, than I can recognize here. You have not been forgotten. We are grateful. This effort would not have been possible without the labor and leadership of our dear departed Rick Black, who spearheaded this effort for the last fourteen months. He will be missed, even though he isn't dead, just moved halfway across the country. Jim Martin from Ashland and retired Medford firefighter Phil Kessler are the second and third heroes of this effort, donating hundreds of hours of their expertise, time, labor and skinned knuckles and good humor. Major cash and in-kind donations came from TP Trucking, the Gold Diggers, Nancy Morgan and James Black. Many, many more people made smaller contributions. Now that the fire engine rehabilitation is essentially completed, a display board will be prepared recognizing all the donors--at least all the donors we wrote down. The last two weeks have been ones of dread and anticipation as we watched the days tick away while we begged and browbeat parts suppliers to pull parts off their shelves and our nuts out of the fire. The much-anticipated steering parts, located by Joe Davis of Aries Muffler in Medford through multiple sources across the West, finally arrived yesterday, June 27. I won't trouble you with the details, but it was only a matter of a couple of hours for Jim Martin and me to sort through the parts available and assemble and adjust a functional steering box, almost as good as a new one. Equally anticipated was the instrument cluster, promised several months ago for shipping June 21st. The owner took pity on me and worked all last weekend on it, and shipped only a day later than he said he would. It also arrived yesterday--and is gorgeous. I doubt new ones were as pretty. Phil Kessler joined us at the garage and the three of us reinstalled the steering box, which involves jacking a ton of 70-year-old metal two feet higher in the air than it should ever hover, then threading the steering column and gears into place--from the bottom. Replacing the gauges is also an acrobatic exercise, necessitating entirely too many headstands under the dash. We referred to the wiring diagram and scrupulously matched the appropriate wires to the appropriate terminals. By this time it was 6:00, but how could we delay starting it up and taking just a little drive around the block? We turned the key, switched the ignition on, pressed the starter button, and it cranked beautifully. But didn't start. Not only didn't start, but none of the lights that Mike Trump had finished working on last week--turn signals, head and taillights, spotlights--worked either. Probably wisely, we decided not to fool with it any more yesterday evening and to attack it again the next day (today). So we went home to ponder the problem and to let the fire engine think about just what it had done. This morning we pulled the instrument cluster out again (more headstands) and checked the wiring. We had wired it correctly. But Jim Martin had an inspiration, switched two wires, and everything works again. None of us really understand why, not even Jim, but we're trying not to question it. Everything works now except the speedometer, and, frankly, at this moment I'm content to drive it without one. This is not much of a concern when it has a top speed of 45 miles per hour. We did find such a place, and with luck we'll have the vehicle back on Monday at the latest. There's still some more work to be done--it'd be nice to have a tailpipe--but by Monday it'll be safe and reliable enough for parade work. Mostly. It's a hoot to drive. I've driven a lot of weird old vehicles, but never one as reluctant to be driven as this one. The only thing that isn't stiff and unresponsive and funky is the turn signals, but since it's too noisy to hear the signal flasher clicking and there's no indicator light, even the turn signals are a problem of their own. After about an hour of experience driving it in town the truck finally decided that resistance is futile and let me shift gears without crashing, but it will NOT be downshifted, thank you very much. You certainly can't say that it doesn't have a personality of its own. If you want to drive it yourself, stop by the SOHS Research Library and fill out a volunteer form. Now that the work of the rehabilitation committee is mostly in the past, we need a new committee maintain it, schedule it, fill the seats and drive it to events and in parades. The SOHS Amphibious Fire Engine needs YOU! Our regular Tuesday work session saw us not at the usual garage but at Joe Davis' shop scratching our heads over the steering gear. Joe manufactures mufflers for Model A Fords right here in Medford, on West Jackson. The steering gear parts had arrived, but Joe and Jim Martin figured out that the root problem--that destroyed our steering gears forty years ago--concerned a part that we couldn't find: The bearings on the sector gear had self-destructed, causing the sector to seize and create excessive wear on the worm gear. What to do? Fortunately, Joe has a friend Dave who rebuilds steering gearboxes. We overnighted the sector to him, and Joe just now relayed that Dave has already replaced our shattered bearings with a steel bushing, and will have the sector gear in our hot little hands on Monday. And when Joe explained the project to Dave, he decided not to even charge us! Joe Davis and Dave Delmue of Morgan Hill, California are the heroes of the week. Thank you both. Meanwhile, in Arkansas, our instrument cluster languishes. When we sent the gauges six months ago they promised to ship them back June 21. When I called three weeks ago they said they were on track to ship them June 21. When I called on June 21 they said they aren't done. (Personnel problems, apparently.) The owner promised to work all weekend to get them done and shipped to us on Monday. Somehow I'm skeptical. Still, once the steering is fixed next week the gauges will start to look like a very small issue. We can always temporarily wire in some aftermarket gauges. Using nothing more than some donated lumber, 100-year-old hardware and about fifty hours of his time, SOHS Board Member Greg Applen fabricated an authentic reproduction extension ladder. It isn't only a beautiful piece of work, it really dresses up the right side of the vehicle. Our new water pumps arrived Saturday. Unfortunately, though we received boxes properly labeled for a left-hand and right-hand 1946 Ford water pumps, inside one of the boxes was a 1953 water pump. Oh, joy. The dealer says the replacement should be here next Monday. We--Phil, Paul and Ben--replaced the right-hand pump without any particular trouble; with luck we'll be able to replace the left-hand pump next Tuesday. With our remaining time we took a collective deep breath and removed our worn steering gearbox. This was necessary because there was about 120 degrees of play in the steering--you'd have to run the steering wheel a third of a turn before the front wheels found out about your intentions. Removing the steering box involves disconnecting the ignition wiring, removing the steering wheel, unclamping and unbolting the steering tube and pulling it out the top. Then we got to unbolt the steering box from the frame and pull the pitman arm from the sector gear shaft. Then we had to jack up the vehicle about a foot and pull the assembly out the bottom. What could be simpler? The first steps were relatively straightforward and trouble-free. Then we put a gear puller on the pitman arm and cranked it and cranked it and sprayed it with penetrating oil and hit it with a sledge hammer and put a two-foot extension on it and cranked it some more and whacked it with the sledge some more. We were getting really discouraged when the arm on its own went BANG! and flew off the shaft. As if it had been going to do it anyway--and we needn't have bothered with all the cranking and oiling and whacking. We then disassembled the steering gearbox, and the internal wear became more than apparent. A repair kit ($200) with new gears, bearings and seals is on its way--theoretically. If it arrives and turns out to be the correct parts, it's looking like it should be a fairly simple repair. In retrospect. While all this was going on Mike Trump continued to do yeoman work on the wiring. Currently he's working on the spotlights and red warning light. The metal contacts are old and tired and corroded; he's taken some of the lights home to ponder them. No rest for the fire engine electrician. If you haven't visited the fire engine yet, we work on it every Tuesday at least 11-1:00 (and sporadically and unpredictably on other days). You can find us at 3263 Biddle Road, Medford, in the back. We'll let you run the siren! With the radiator repaired and back in place, Phil, Mike and Joe filled it with coolant and were ready to take it for a drive around the parking lot--which they would have done if the leaks hadn't been so intractible. Turns out one of the petcocks and one of the water pumps is leaking. This is actually a good thing. The stock water pumps on the old Ford V8s were notoriously inefficient--they did a better job of stirring the water than actually pumping it through the engine. Not a good thing for a fire truck that will spend much of its future idling in parades in the summer heat. We'll replace them both. I'll drive to Bob Drake's in Grants Pass tomorrow and pick up a pair of redesigned, modern water pumps and we'll install them next Tuesday--if one of our stalwarts will bring a floor jack. Fun fact: the engine mounts are molded into the water pumps, so we need to jack up the engine to replace them. Mike Trump wired in the turn signals two weeks ago, and Tuesday he fixed them so we'll be able to turn in both directions. More wiring to do: license plate light (it's never had a license plate on it), red signal light and spotlights. I got a phone call today from the company in Arkansas rebuilding our instrument panel. They say they're on track to have it in our hands the middle of June--with a lifetime guarantee. It'll cost us $750. If you haven't visited the engine yet, we work on it every Tuesday at least 11-1:00 (and sporadically on other days). You can find us at 3263 Biddle Road, Medford, in the back. We'll let you run the siren! 6 new tires and powder painted wheels were delivered today courtesy of TP Trucking and Craig Turner. We have a lot to do to get the Fire Engine roadworthy again. We are asking the community to volunteer their automotive talents and resources to our effort. both volunteer there; Rick is on duty every Wednesday and Ben works on several projects on various days.